On your way through our rolling countryside, do plan to take in the many attractions and events. On behalf of Oxford County, we welcome you! Oxford County lies nestled amongst rolling hills in the heart of Southwestern Ontario. The highways and by-ways provide easy access to our county. We offer history, local produce, fine cuisine, sports, theatres and museums, not to mention great shopping. At the end of the day, plan to relax & enjoy our hospitable Bed & Breakfasts. Oxford County's Bed & Breakfasts offer a wide range of styles and locations exposing our guests to the sites & sounds of everyday life in rural & urban settings. We open our homes as Bed & Breakfasts to the traveling public, offering safe, comfortable and hospitable accommondations. To ensure a good start to the day, guests enjoy a variety of breakfasts provided by the hosts. To view the web sites of individual B & Bs, please see list to the left and contact them directly for reservations. 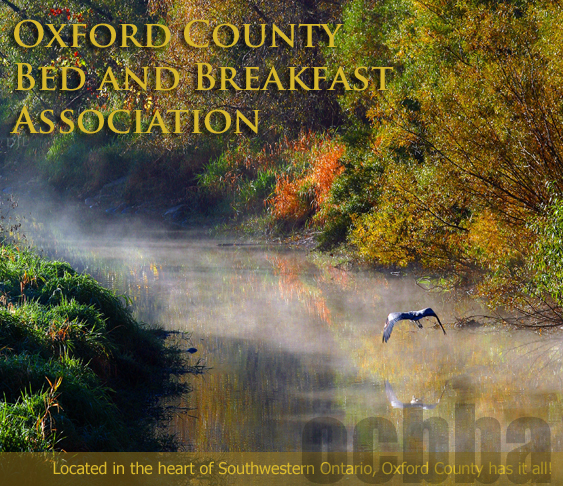 To inquire about the Oxford County Bed and Breakfast Association, please send us an email. We'll be happy to hear from you.